Summer School. The Bigger picture. This summer school is aimed at weavers who would like to scale up their weaving, from small frame loom to something larger. How do we decide what size to weave, and what do we need to consider when scaling up a design for tapestry? We will begin the week by selecting and developing a design to be scaled up to a larg(er) tapestry. It could be a detail from a design or something you have already woven but wish to explore on a larger scale. After scaling up your design and drawing a cartoon, we will go on to consider the set and size of the warp, the thickness of the weft and how this impacts on the quality of the woven surface. With your design resolved we will look at the different ways you can work on a larger scale. From continuous warping a small frame loom to setting up a large scaffolding loom with warp and leashes.This workshop designed for students with some experience of weaving to advanced practitioners. A structured start to the week is followed by guided independent studio time. There are limited place on this 4 day intensive course. For students who have some weaving skills/experience, and for more experienced weavers who want to expand their skills. The focus is on working is to explore a larger scale than you are used to. You will not be expected to weave a large tapestry in 4 days but to explore scale of marks and weave required to work on a larger scale and encourage you towards an independent practice. Fiona Hutchison graduated from the tapestry department, Edinburgh College of Art in 1985. She exhibits regularly in the UK, Europe and internationally. 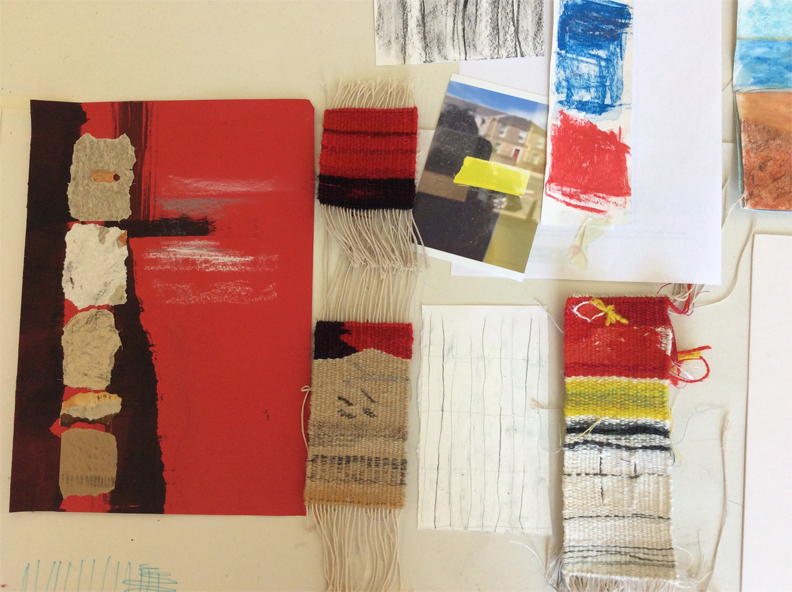 As part of here creative practice Fiona runs a wide range of workshops in her Edinburgh tapestry studio form private tuition to mentoring emerging artists, she also teaches credit course at Edinburgh University and weaving experiences at The Dovecot Studio. Workshops run from 10am – 4pm. Selection of materials will be provided. Book 2 more workshops/or early booking in full – 10% discount.